Happy Wednesday to you! Pin Headed is a simple twist on a classic game. The great thing about this game is that it’s super simple to explain and easy to set up and tear down. While playing this game is pretty simple, getting the items for it will be the bulk of your work. You can find over-sized plastic bowling pins online (Toys R Us sells them for less than $20) and if you need to pick up a furniture or car dolly at any hardware or automotive shop. I recommend buying cheap helmets because you’re not going to be using them for very long and they are just a safety precaution. Overall, this game can cost around $50, but if you ask around I bet you can find everything with the exception of the plastic pins. Here’s how the game is played: mark your start point and set the pins up at a good distance from the starting line (do a test run beforehand so you know how far students can push one another). Once everything is set up, separate your group into teams. The PINHEAD will be wearing a helmet and either sitting or laying on the furniture/car dolly. If they are sitting, they need to keep their feet off the ground and their hands on the cart. If they place their feet on the ground they can shift the dolly and that results in an automatic gutter. The PUSHER will simply line up at a good distance behind the start line and push the pinhead forward toward the plastic pins. They must release the pin-head without crossing the start line. Failure to do so results in a foul (be lenient here). Each combo gets two turns to try and know down all the pins (unless you’re in the tenth frame). If you are unsure how to score bowling, you can click on the How To Score Bowling link to get all the info you’ll need. IMPORTANT! Make sure to have a “catcher” on the other side of the pins. You’d be surprised how fast some of these students get going! This simply ensures that they don’t unnecessarily bang into a wall and hurt themselves. 1. Instead of buying a furniture or car dolly, ask your friends on Facebook if they have one. You can also pick one up on Craigslist for a lot less. The same goes for helmets as well. 2. If possible, have an extra dolly, extra bowling pins and a couple helmets. If you have a large enough space, you can play two games, or you can simply speed things up if you are playing with only one lane. 3. Spice up the game by decorating the room like a bowling alley. 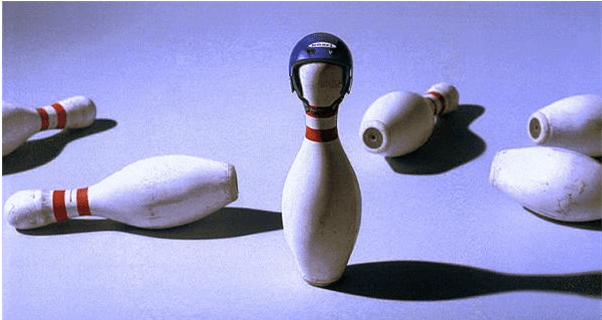 Use colored tape for your lanes or paint bowling pins on the helmets. Maybe even have some funny announcers doing some play by play. 4. Award a trophy to the winning team. I recommend going to a local bowling alley and asking if they have extra pins. I made a few calls and got a few for free and paid $2 for some others that looked a bit nicer. You can paint the pin gold and award it to the winners or just have every person who “bowls” a strike sign it with a permanent marker. 5. Make a video for your students and post it on Facebook. If you have someone who’s decent with editing, this is a great game to use some slow motion features on. You’ll capture pins exploding and awesome facial expressions too! So there it is, Wednesday’s Wild Game. To get more great games and helpful tips, subscribe to our blog or follow on Twitter @stumingames! StuMinGames seeks to equip Student Pastors and Youth Leaders with fun and relevant games that are designed to connect your students through moments of excitement, laughter and sheer craziness. Our prayer is that this blog is a resource to help lighten your load. We hope that you’ll subscribe to our blog and check back every week for updates.